Kyzir White‘s promising rookie season has likely come to an end. The Chargers announced that they’ve placed the linebacker on the injured reserve. The team has promoted cornerback Jeff Richards from the practice squad to take the open roster spot. White, a fourth-round pick out of West Virginia, was moved from safety to linebacker shortly after being selected in the 2018 draft. He ended up earning one of the starting gigs, and he proceeded to start each of his three games. In those three appearances, White compiled 17 tackles, two passes defended, and one interception. The 22-year-old didn’t end up playing enough snaps to earn a spot on Pro Football Focus‘ rankings, but his score would have placed him just outside the top-30 among 81 eligible linebackers. Unfortunately, the rookie suffered a knee injury during Week 3, and he subsequently underwent surgery. The organization presumably thought that he’d be able to return to the field before the end of the season, explaining why they kept him on the active roster for so long. Richards, a 2013 undrafted free agent out of Emporia State, has spent time in the AFL, CFL, and NFL. 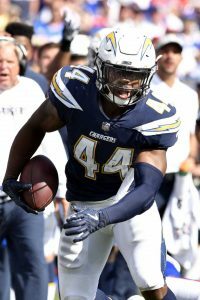 Besides a brief stint with the Buccaneers, he’s spent most of the past two seasons on the Chargers practice squad. He had a standout preseason, compiling 11 tackles and one pass defended.